FACULTY180 contains a formal activity input workflow process that allows faculty members to input and manage their information and activities in the Activity Input Form. This saves faculty members time and can enhance data completeness and accuracy. Note that faculty members can log on to FACULTY180 and manage (add, edit, or delete) their data in the Activity Input Form at any time. The formal input workflow process is typically initiated when an institution's official enrollment numbers have been finalized. At that time, administrators upload the courses taught to FACULTY180, verify the employment status (full-time, part-time, etc.) of each faculty member, and then communicates with faculty members (through FACULTY180) that the faculty input process has started. Faculty members will then have access to their courses taught data where they can upload course-related supporting documents, such as syllabi, student evaluations, peer evaluations, and other documents that support their teaching. On the Navigation menu, click from the Admin section, then select Administration. Workflow Form: Select a workflow from the list to limit the results to workflows using that specific form. 4. 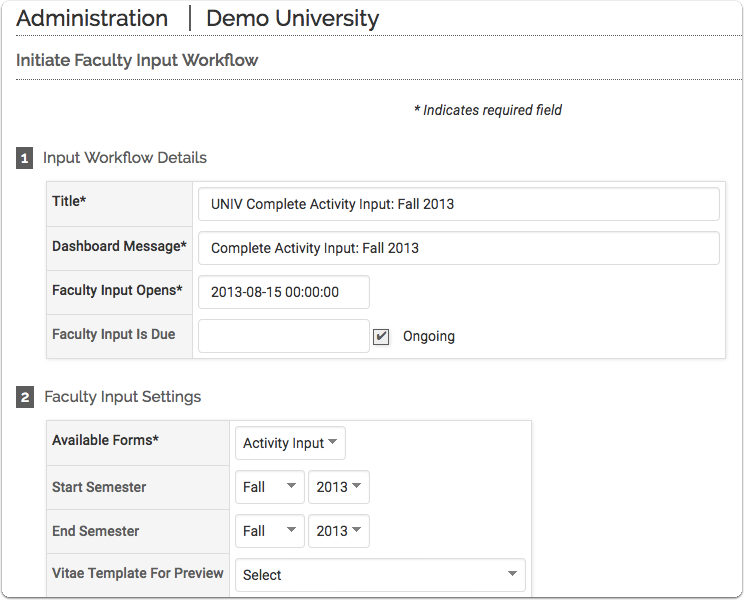 Edit an existing scheduled input workflow, or click Add to create a new faculty input workflow. Complete the following sections. When finished, click Save. The name of the process should be descriptive - using ‘action’ terms will give the faculty member an idea of what they are to expect to do. The activity input approval workflow allows for multiple levels of approval. The default first step in the approval workflow is the faculty member self-submission of the activity input form, where the faculty member submits the activity input form for approval. From here, additional levels of approval steps for administrators can be added to the workflow by clicking Add Step. The Submit Button Label and Reject Button Label text can be changed for your institution's preference, and instructions can also be added to the workflow (the instructions displayed at the top of the activity input form). To delete a step, click the Delete icon in the Actions column. If an institution chooses not to utilize the workflow steps functionality, the default step for faculty members to submit their activity input form still applies. To select the faculty members to be included in the faculty input workflow, click Select Faculty. (See Working with the Faculty Selection Tool for more information.) Notification messages for faculty members that are participating in the faculty input workflow will display on their dashboard in the To Do section. If a new faculty member needs to be added to the workflow after the workflow has been created, they must be added manually, there is no dynamic process for adding new faculty members to the workflow.